It is starting to become that time of year again where people are jetting off on their holidays, whether it be to another part of the country you live in or somewhere else. A getaway is a getaway and everyone needs time out to relax, eat lots of food and spend some time on the beach. I usually leave all my holiday posts for August, but this is probably the best time to publish as the holiday season has pretty much started. 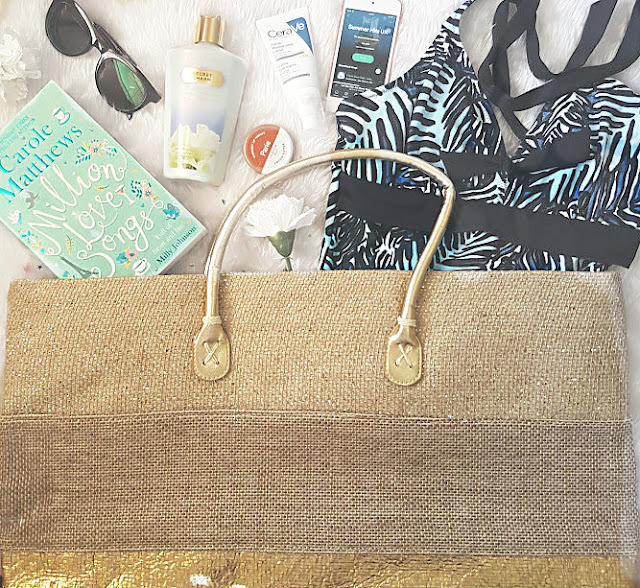 Today's post is all about my beach essentials, I love spending time by the sea and when you're armed with these essentials you will not want to leave. Before even thinking about the things you need for the beach, you need something to put it all in. I am obsessed with this Simply Beach bag*. Investing in a good, big, beach bag is an priority for me - I need something that I can throw everything in and go out the door with. This one is very simple but the gold handles and gold sequin detailing at the bottom of the bag gives it a bit of edge and makes it look more glam. It also lies flat, so can be packed right at the bottom of the case. > The number one thing you can't go to the beach without is SPF. Nothing is more important than protecting our skin, we only have one of it and it is vital that it is correctly looked after and cared for. All over body sunscreen wise, as a family we love any brand and tend to just share but I always have a separate one for my face, as its super sensitive. 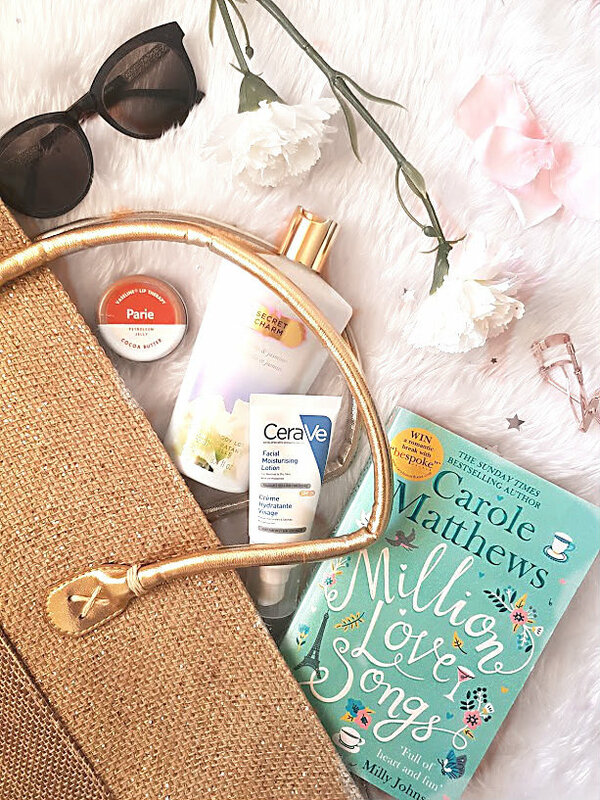 Recently, I have been using the facial moisturiser with SPF from Cerave (now available in Boots). Its a fast absorbing formula, that doesn't leave the skin feeling greasy and gives the protection that the skin needs. > For me, sitting on the beach without something to do is like hell. I love getting a tan and playing in the sea but I need some entertainment. This is usually in the form of a book, which I have to buy at the airport (kind of a tradition). Along with my Ipod to listen to some music, these two things keep me relaxed and make me feel like I'm on holiday. I can just picture myself now, sitting on a lounger with my feet up, book in one hand, drink in the other - pure bliss. > You can't visit the beach without something to wear! Personally, I have never been a girl that wears two pieces, I'm more of a one piece girl and when they are as beautiful as these two pieces* from Simply Beach - wouldn't you want to be as well? There are two things in life that I hate buying, jeans and swimwear. It is always so difficult to find pieces that fit like a glove and make you feel comfortable. What I love about these swimsuits is that they're based on cup sizes. Simply Beach have a whole range of cup sized swimwear that works in your favour, so you can feel comfortable and secure when having everything on show. 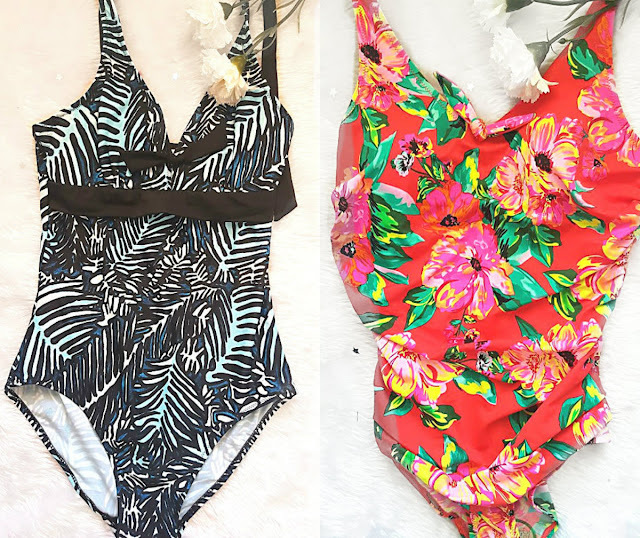 The swimsuit on the left is a very tropical pattern, with a low neck and straps that can be worn in a number of different ways. This is the one to wear when you want to tan and not get lines! On the right, is a very bright, bold and flowery suit that just oozes Hawaii (where I'm going this year) and will look amazing on the beach. The colour is also very summery and will look gorgeous with a tan. I don't quite have the beach body to show these off yet, but just from trying them on, I know that they are going to be great to wear. > Something that my friend got me into years ago, is actually taking some Vaseline with me when on the beach. My skin gets really dry after a dip in the sea and being outside all day so keeping some on hand helps to cure the dry skin and is great to remove sand from the toes too. Another top tip, is keeping baby powder with you when you go the beach as it removes the sand with ease. > Can't be at the beach without a good pair of flip flops, sunglasses and a cover up. I feel like these are three obvious essentials but still need to be mentioned. This is the first year I have invested in prescription sunglasses. Usually I go blind and just wear normal ones but I can't see - so I treated myself to pair and they are life changing. 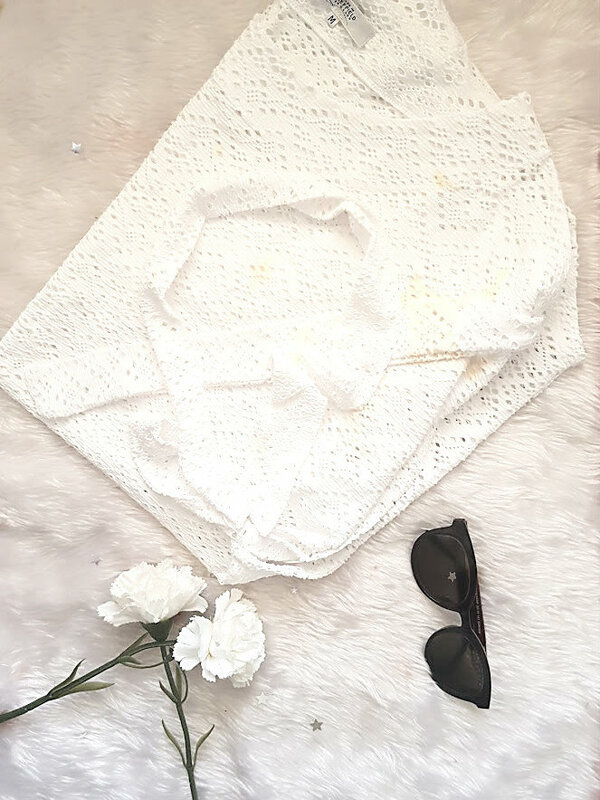 This white sun dress* is perfect to throw in the beach bag to change into after or wear on top of swimwear when going to the beach or elsewhere. It has wide short sleeves and a tie at the waist to elongate your figure. White is also the perfect summer colour. I am so excited about going away, and this post is getting me even more excited! What are your beach essentials?